The morning was blessed and inspired by the aura and speech of our honored guest speaker Dr. Tamara L. Thomas, Vice Dean, Academic Affairs, Loma Linda University School of Medicine. The theme of the inspirational speech was based on the motto: “Through Christ healing and wholeness”. She enlightened the audience through the philosophy of William Osler who proclaimed that the profession of a physician is a calling and not a trade; an art and not a business. That it was also metaphysical philosophy where we look beyond the mere objectivity of status quo. Hence, it promotes a sense of meaning and purpose in our actions that contributes and gives rise to our spiritual identity. Thus, the perspective is set to more on “being” than mere “doing”. Treating it as a profession rather than a mere occupation. It was emphasized that a physician’s perspective should be well-balanced with empirical judgement, absence of bias and no discrimination. The physician should be an advocate of the community, an everlasting seeker of truth and a servant of God. The event featured a number of important guests as well. These included respected President Dr. Fransisco D. Gayoba, beloved Dean of Medicine Dr. Doris D. Mendoza and admired VP of Academic Affairs Dr. Miriam P. Narbarte were present to lead and support the occasion. Many of the faculty members of the College were also present. Among them were, Dr. Bibly L. Macaya, Chair of Clinical Sciences and President of Adventist Medical Center-Manila, who led the opening prayer. Dr. Bienvenido R. Tamano, Chair of Admissions Committee and chair of Family, Community, Preventive Medicine and Research, who introduced the class of 2021. Whereas, Dr. Linda L. Varona, Clinical Coordinator of Adventist Medical Center-Manila, led the students’ promise. 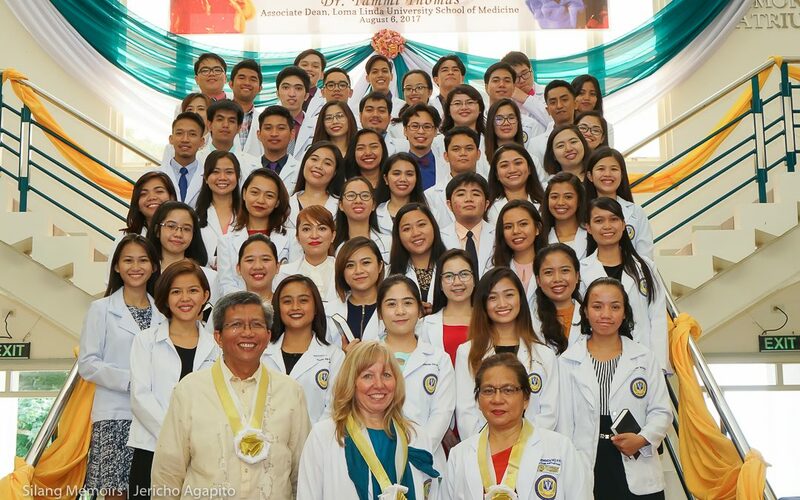 The 3rd White Coat Ceremony, is an essential program that elevates the spirit of the student to be focused and steadfast through the taxing semesters. The program helps the students to remember the purpose of their existence as physician missionaries. As a result, it motivates them to strive harder and go beyond what we have ever imagined of achieving. To go on and be five-star plus physicians.